community is more or less in abandon state, am I missing something? > work. It brings errors. > community is more or less in abandon state, am I missing something? I will look at it then. It is a good excuse to learn more. Found two issues with missing newDiv and newSpan. Third issue is with the rendering from the members edit popup. I try to play with the table width but it has not effect. e := WebElement newDiv class: #('todo-form' 'todo-nowide'). e table width: 1. "100%"
e cell addTextH1: 'Member selection'. 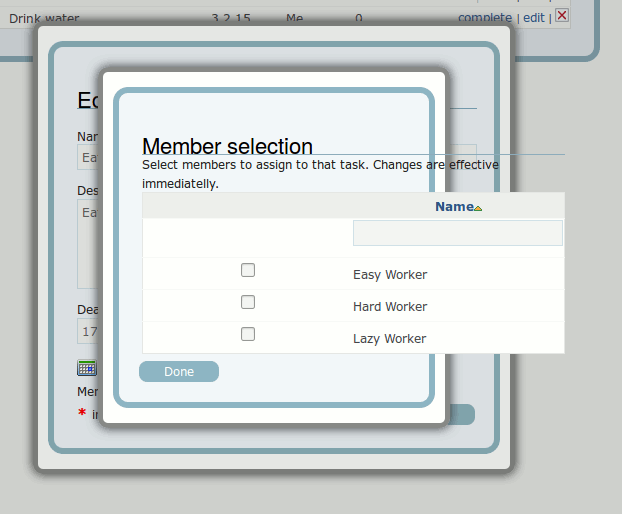 e cell addTextSmall: 'Select members to assign to that task. Changes are effective immediatelly. '.